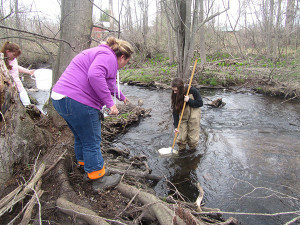 Nichol DeMull, of Trout Unlimited, instructs a CTA student on how to search for insects in Cedar Creek. Photo by J. Reed. 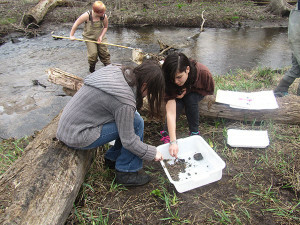 Stream monitoring done by Creative Technologies students this week show that Cedar Creek has excellent water quality, according to Nichol DeMull, of Trout Unlimited. 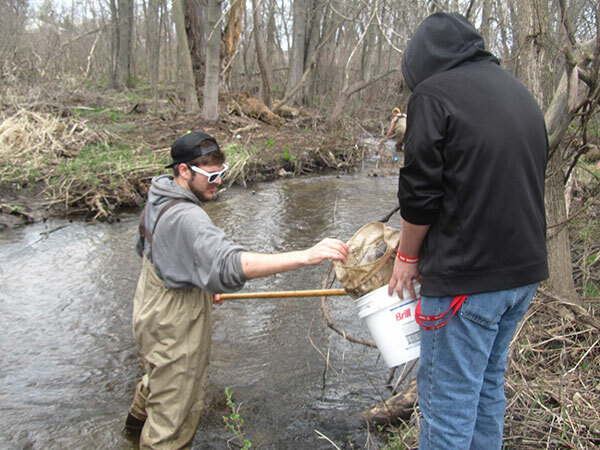 CTA biology and conservation students and teachers Jim Fredenberg and Trisha Rose teamed up with Trout Unlimited this week to do stream monitoring in Cedar Creek, at Riggle Park. According to DeMull, Fredenberg contacted her about possibly participating in the activity, since the school is nearby. DeMull and Jamie Vaughn did a presentation to the students on Monday, April 18, and the students donned waders and gloves Tuesday, April 19, to collect bugs from Cedar Creek and identify them. Some students waded through the Creek to scoop up the bugs, other students helped empty the nets, and others sorted through them. They identified and counted them, and recorded what they saw on a data sheet put together by the Michigan Clean Water Corps. Students identify and count bugs found in Cedar Creek. Photo by J. Reed. She said the students identified the kinds of insects, whether they were rare or common in the stream, and used a formula to come up with the Stream Quality Score. CTA students teamed up in several groups to monitor bugs in Cedar Creek. Photo by J. Reed. DeMull said that we can assume that the excellent stream quality extends to a certain degree in both directions from Riggle Park. “We have another monitoring location at the mouth of Cedar Creek that we have been monitoring for about 5 years now. It also has an excellent stream quality score based on the stream insects found there,” she said. She said that they will continue to work with Creative Technologies Academy to work on Cedar Creek. “Something that Trout Unlimited is certainly interested in is having community members become stewards of their home waters,” said DeMull. Trout Unlimited is still looking for volunteers to help with another stream monitoring event coming up on Saturday, May 7 from 9 a.m. to 1 p.m. at the Rockford Community Cabin, 220 N. Monroe St. in Rockford. Volunteers will be assigned to a monitoring group with a team leader. Each group will collect and identify insects from different stream sites in the Rogue River and Bear Creek watersheds. You don’t need any experience with stream insects to participate and all ages are welcome.